An outfielder is a person playing in one of the three defensive positions in baseball, farthest from the batter. These defenders are the left fielder, the center fielder, and the right fielder. 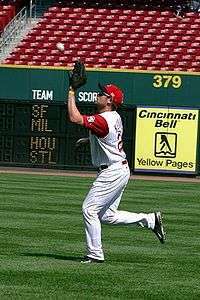 An outfielder's duty is to try to catch long fly balls before they hit the ground or to quickly catch or retrieve and return to the infield any other balls entering the outfield. Outfielders normally play behind the six other members of the defense who play in or near the infield. An example of an ultra-fast left fielder is Rickey Henderson (Ben Oglivie can fit this description too), whereas the slow-footed but very strong-armed Carl Furillo, "The Reading Rifle," sets a standard for right fielders in the terms specified here.